Part of the Proceeds go to the Chandler High School Tennis Program! 16-year-old Ally "Smash" Mash (Lindsey Shaw from Ned's De-Classified School Survival Guide" and "10 Things I Hate About You") dominates all comers on the tennis court. She has no time for lazy heartthrob Farrell Gambles (Emmy-nominated Chandler Massey from "Days of Our Lives"). 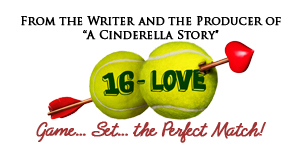 But when a twisted ankle and an arch-rival intervene, she teaches Farrell what it takes to win on the court, and he shows her what "love" means off the court.